Upon entering the door of the old house, this is the sight that greets you. 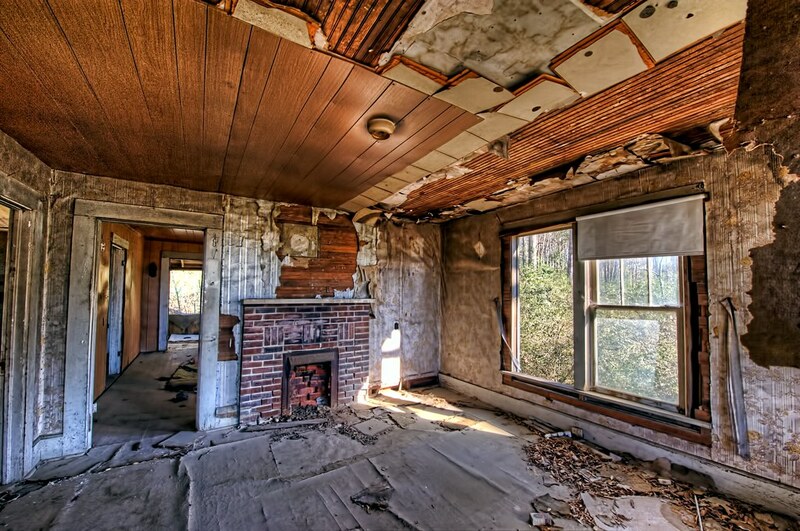 Even though it’s sad to see a house in such disrepair, one can’t help but try and imagine what happened in this room. Who lived here? Were they happy? Did something awful happen here that caused this place to be abandoned, to slowly return to the elements? The room is coming apart, layer by layer. Wood paneling on the ceiling gives way to acoustic tile, which gives way to insulation and wood. Wallpaper gives way to older wallpaper, which gives way to wood. Multiple layers of flooring are peeling away, and the underlying structure is rotting back into the ground. Only the brick in the fireplace seems permanent, although it too will eventually dissolve. If only the walls could talk…. Shot with the Nikon D700 and my 14-24mm glass. Six-exposure HDR. Click on the photo and view as large as possible. This entry was posted in Commentary and tagged abandoned, architecture, D700, HDR, Mississippi, Nikon, Paint Shop Pro, photography, Photomatix, Topaz, Tupelo. Bookmark the permalink. I wish we had such wonderful places. Great job.